Master number 22 is considered to be very good sign and is a symbol of success. The destiny of these people is complicated, but saturated and interesting. Your downs will be painful, but the ups will be amazing. However, you need to be careful in the choice of friends and always count on yourself in times of trouble. Your way of thinking is full of creativity and demands expression. Your ideas are interesting and you can make a living from them. You can be a nice teacher, tutor or consultant, because you're enthusiastic and willingly share your experience, and what's more important you like to feel appreciated for what you know and can do rather than for your looks. 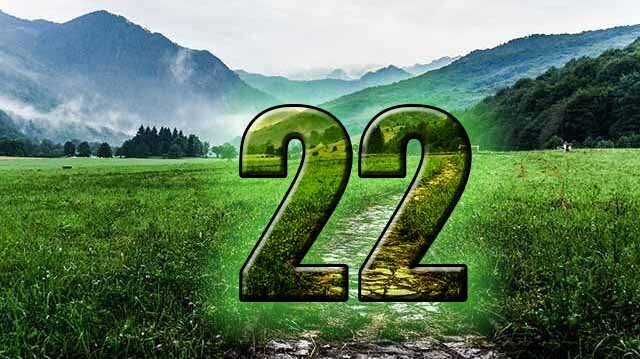 Number 22 is like an oxymoron: you tend to illogical decisions and are often passively follow the flow of your life, but you always stand strong on your two and have a pragmatic point of view. When you have the idea it's something in complex – you know the details and have a ready plan of implementation in few variants. And it is amazing, as with such skill the problem solving is just easy for you. You are loving and caring person, but usually you fall in love with an image or a peculiarity of the partner rather than with all features combined in one. It may bring you problems and frequent disappointments. In love you're a bit infantile, redirecting on or blaming your partner in your problems. Your love life won't be easy, and will require instant work on yourself and consensuses. You perceive all information fully, as your mind has such a versatile state. You think globally and take consequences into account. That's why you are suitable for very responsible professions: militarist, diplomatist, politician, international translator, lawyer or judge. Despite all these strict professions you are talented and you're able to make the dullest work in a bright self-expression. Often you achieve such result due to professionalism and creativity combined together. As you're talented and need powerful self-expression it is often displayed in high level of your ambitiousness. You set a point which you want to reach and it motivates you. Thanks to your enthusiasm and confidence, people perceive you as an authority. Because you are used to work hard and have a particular amount of experience you often think that others work not as hard and you tend to underestimate people around. You express yourself mostly in your hobby or profession, but you don't mind the looks. Maybe it is time to change your image, usually inner perception of self also changes.